The University Gospel Chorus at the University of California, Berkeley started in the nineteen seventies as an informal activity of students who were interested, and in some cases, experienced in the tradition of gospel music performance. The Gospel Chorus subsequently became an ensemble of the Choral Music Division of Student Musical Activities (Associated Students of the University of California). During the nineteen-eighties, Silvester Henderson, a professional gospel music conductor and pianist, was appointed the Director of the Chorus, and the organization developed into an excellent ensemble musically. Concerts began expanding beyond the campus in the San Francisco Bay Area and other parts of the state. 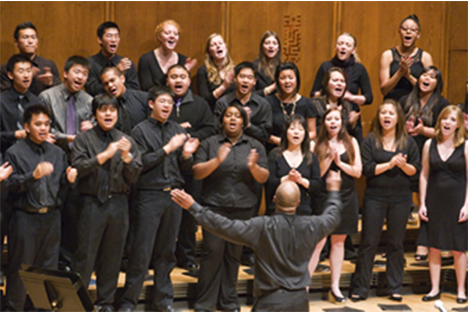 In 1996-97, the Gospel Chorus became an ensemble of the Department of Music as a part of its curriculum in music performance. Since 2007 D. Mark Wilson has taken the Gospel Chorus in new directions, building a repertoire which includes traditional and contemporary gospel music, spirituals and classically influenced gospel anthems, as well as performances at local social justice events.